It is the latest news Staff Selection Commission has released notification of Cancellation of Combined Higher Secondary Level (CHSL) 10+2 Exam 2014 due to continues complaint received regarding irregularities and malpractice in the conduct of examination exam held on 2nd November 2014, 9th November 2014 and 16th November 2014. These dates of examination of NR, NWR, CR and MPR Region held at various centres all over the country have been cancelled by Staff Selection Board. The SSC CHSL Exam 2014 has rescheduled to a new date of 15th February 2015. The important news is that a descriptive exam will be conducted for qualifying nature to the candidates who will appear in SSC CHSL Re-exam rescheduled on new date. The date and venue of descriptive exam will be released by SSC on the official website. The SSC CHSL Re-exam 2014 Admit cards will be released on the official website. Those candidates who had appeared in the SSC CHSL Exam 2014 held in the month of November 2014 on the specified dates or centres can download their admit cards/call letters/Hall Tickets from the official website of SSC whenever it gets released by SSC. The syllabus of SSC CHSL Re-exam 2014 will be same as it was published in the notice released by SSC on 19th July 2014. The Staff Selection Commission has released notification in which it is said that the SSC Combined Higher Secondary Level Exam (10+2) CHSL held on 02nd November 2014 has been cancelled. The cancellation of Exam is for Lukhnow centre only. 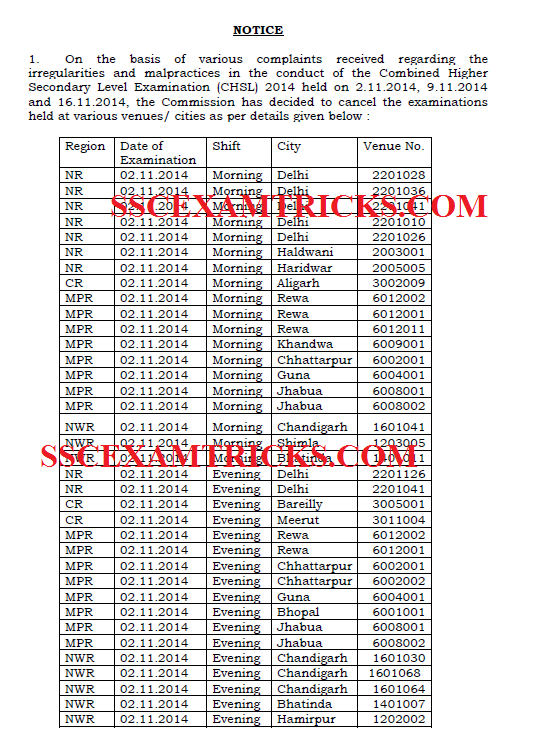 Re-Schedule of SSC CHSL Exam 2014 will be conducted on 16 November 2014 and Admit Cards will be sent by Post.